Tens of thousands of Serbs gathered on February 5th in downtown Belgrade responding to a call by the opposition Serbian Progressive Party (SNS) to protest against the poor economic situation in the country and to call for early elections. The rally, held under the slogan "Fight for changes", was attended by more than 55,000 people - the biggest demonstration in the Serbian capital in years. SNS leader Tomislav Nikolic, a former activist of the Serbian Radical Party, blamed again the government for corruption, bad management and unfulfilled election promises. He gave the ruling coalition a deadline until April to call early elections or to face continuous protests. Nikolic conveyed one more message to the government - listen to people's voice. In contrast to Tunisia and Egypt, the opposition rally in Serbia ended peacefully and without incidents amid heavy police presence. The protest in Belgrade was held against the background of strikes across the country. Teachers and police officers walked off their work while doctors and pharmacists warned they were are ready for a work stoppage. Wages in public sector and pensions were frozen due to Serbia's stand-by arrangement with the IMF that required strict fiscal discipline. Serbs have felt the impact of the financial crisis with rising prices and low incomes. Although the ruling Democratic Party (DS) of President Boris Tadic said it saw no reasons for early elections the mass demonstration should make the government consider the situation more seriously. The ruling coalition has repeatedly said that the next elections will be held as planned in 2012. The only transformation expected in the near future was government's reshuffle with the aim to reduce costs. The mass attendance at the rally showed also the growing support for the SNS. 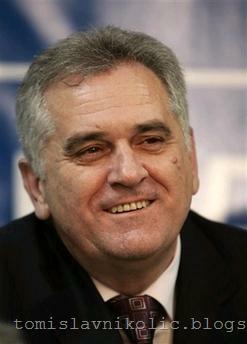 Nikolic, who was one of the leaders of the Serbian radicals, had established his party in 2008 after disagreement with the leadership. He distanced himself from the hardliners and supported Serbia's EU integration. The party has been gaining strength since then and is currently right behind the DS in terms of popularity. It's not the first time when Tadic and Nikolic stand against each other in a competition. At the presidential elections in 2008 Nikolic won the first round as a candidate of the Serbian Radical party but was defeated by the pro-western Tadic at the second round. The choice was portrayed back then as a nationalist past or a European future. Tadic's party won a surprising majority of the votes at the May 2008 parliamentary elections despite all surveys that had predicted victory for the radicals having in mind the mood spurred by Kosovo's unilaterally declared independence. Two years later, however, lots of Serbs feel disappointed because of the unfulfilled promises for new jobs and a clear EU prospective. That's how Nikolic's party is gaining popularity as social discontent rises. The party has recently launched its campaign for early elections while in January it submitted an initiative to amend the constitution aimed at cutting the number of lawmakers from the current 250 to 125. The idea is to save money and make the parliament more functional. 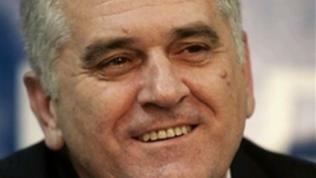 Tomislav Nikolic gave the government a two-month deadline. If his call is not met we'll probably see him sitting in front of the parliament on styrofoam as he figuratively promised at the rally on Saturday. How many will follow his steps?